Today’s technology makes it easier than ever to stay in touch with family and friends, work remotely, and keep tabs on news, entertainment, and personal finances back home. Yet, traveling frequently demands connecting to public WiFi or cell networks, where passwords, banking information, personal correspondence. And anything you do online can be viewed by a third party. And if that wasn’t bad enough, more and more governments are choosing to block everyday content and major social media sites, while many companies are placing more restrictions on which regions of the world can view their websites or play their media. Looking for VPN travel recommendations? Jump to the bottom or click here and I’ll magically take you there myself. Before I used a VPN when traveling, I encountered a baffling number of issues online all over the world while just trying to do simple [yet sometimes really important] things I took for granted back home. Things like checking my annual credit report, signing into PayPal, trying to call family on Skype, or even just logging into my own email were often impossible tasks overseas. That’s not even mentioning the lesser annoyances, such as not being able to access reputable international news outlets, Facebook, or a link to an SNL clip my sister sent me. The first time I dabbled in using a VPN during travel was on our first visit to China in 2012. We were warned ahead of time that using one was the only way we’d be able to access our email, Facebook, or Skype (or access my blog, for that matter)—you know, basically every means of communicating with our family and the outside world for over a month—not to mention that if we were able to get online, all of our banking info and correspondence could [edit: most-certainly would] be viewed by a third-party. The free VPN I utilized back then met our basic needs, but barely. It was a bit finicky, and not the least bit dependable. But it allowed us to check our email more than we would have otherwise. A few months later, the company scrapped their free version, so I tried another free VPN for a while, until that company started charging. Even long after leaving China, I was hesitant to do away with the VPN while still traveling, particularly for doing things like making airline ticket purchases and conducting online transactions in coffee shops and hotels/guesthouses. When we moved to Laos, I went about the business of researching all the VPNs out there and finally landed on a basic subscription with PureVPN. It’s been over a year now and I’ve been pretty happy with both the app and the service. It ticks all of my boxes and works as advertised. So…What Exactly is a VPN? A VPN is short for Virtual Private Network. Essentially, it’s software and an online service provider combined to create what amounts to your own secure and private pathway to the internet. A VPN encrypts the information you send and receive before it heads out into the world, making it very difficult for hackers, thieves, or others to view this information. This is exactly what you want when you’re conducting anything sensitive over a public (or even a private) network, such as entering passwords, making a credit card purchase, or emailing about Aunt Betty’s stomach-churning lemon surprise. Many VPN providers have servers all over the world, and you can choose which one to connect to. Once connected to Iceland, for example, the connection is treated as if you were sitting in your cozy home in Iceland, watching the aurora borealis out your front window, which has many advantages that we’re just about to dive into. So, without further ado, here are our list of life-changing VPN travel solutions! Prior to using a VPN, I was pretty apprehensive to enter sensitive information over an unsecured public connection like a coffee shop or hotel, even in the U.S., and even with my own computer or device. It’s pretty darn easy for bad guys to exploit public networks depending on the configuration (it happens with surprising frequency), and I didn’t have a lot of faith that the corner cafe WiFi had me covered. On the road (particularly on overseas backpacking and work trips) it can be impossible to find a trusted connection to log on to banking websites, purchase plane tickets, book hotels, or even to check personal or work email. Once I had a good-working VPN, that all changed. I was free to buy last-minute plane tickets on a reputable website, pay a bill, or make a check deposit without having to worry about the security of my connection, anywhere in the world I could find an internet connection. If you travel for extended periods of time, you know how crucial this can be. This one’s a biggie. I don’t know how many times I’ve been working/ traveling/ living in an area of the world far, far away from North America and had trouble logging into services I take for granted back home—like, kind of important services. PayPal’s one that instantly comes to mind. They REALLY don’t like it when you log in from somewhere new and different from where you had been logging in. Most websites will send an email to you so you can confirm your identity. This isn’t enough for PayPal. They’ll LOCK your account and either call or text the phone on record with an unlock code—which is LOADS of fun when you’re traveling internationally with no way of accessing your home phone. This has happened to me more times than I can count. And PayPal’s not the only online service that does this (though one of the most frustrating in my opinion). With VPN enabled (and a U.S. IP selected) getting locked out of PayPal rarely happens to me anymore (though, occasionally, I get surprised). It’s also a great way to avoid those annoying Captcha tests (where you are asked to select all of the squares with cars or store fronts), which is an added bonus since I rarely seem to get those correct. This one can be anywhere from an added convenience to truly life-changing, depending on your circumstances. In some countries, VoIP (Voice-over Internet Protocol) services like Skype are blocked out-right. It wasn’t a surprise traveling through China that this was the case, but it was a surprise when we moved to Belize in 2013. For whatever reason the government had blocked Skype, making it challenging (or expensive) to keep in touch with family and friends (or for me, to participate in weekly work calls in which all my colleagues in Central Africa and Washington, DC used Skype). As I already mentioned, the situation was even worse in China—Facebook, WordPress, even our personal emails on Gmail were blocked. And China and Belize are not alone. Using a VPN in China made our lives much more hassle-free, but in Belize, it really did change our lives. We were able to easily communicate with family using Skype, and I was able to participate in critical discussions that directly impacted my work. I was sitting in a local restaurant one day in rural Southern Belize when I finally caught an internet signal after an hour of trying. Minutes later I learned from an email that one of my card companies had been hacked, and I also received an alert that there had been some suspicious activity in that account. After doing the necessary checks and chatting with the company, I thought I should probably check my credit report for suspicious activity. Problem, was I simply wasn’t allowed to access any of my credit reports from Belize. Something similar happened as I was traveling through East Africa a year later. I needed to access my credit report but was blocked from doing so. Thankfully, that second time, I had access to a decent VPN. I turned it on and was able to access my report with no issues. Fortunately, I don’t encounter many instances where something as important as accessing your credit history is off-limits overseas. Most frequently, I find that region-locked content involves media, such as trying to watch a sports match, tv show, newscast, or video clip (SNL is notorious for this) while in a country that’s not licensed to provide that content. A VPN makes all of this a non-issue. This is an interesting one that I only recently discovered while developing this website. Oftentimes businesses offering public WiFi connections like coffee shops or hotels will put limits on what you can do online, which is generally a good thing, in my opinion. In a country like Laos, it’s incredibly frustrating to be cruising along with work online, only to have someone sit down next to you, start streaming a movie in HD, and watch your internet speed grind to a halt (what’s even worse is people in Laos don’t seem to ever use headphones to do this…ever, but that’s a whole other thing). Many businesses block this type of activity, along with downloading anything substantial, or connecting via FTP (File Transfer Protocol). If you’ve worked in web development, however, you know how critical it can be to have access to an FTP, even just to update one small file. A VPN makes this possible. I go to great lengths not to abuse the VPN in these circumstances, because I do think the restrictions are there for a good reason. But sometimes in order to make headway, I just need to update one small file, and being able to do so avoids a lot of frustration. With that said, there are coffee shops that block the use of VPNs outright, making it virtually impossible to bypass their restrictions. I understand why they do it, but I don’t agree with this hardline approach. Customers should at the very least be able to securely access their email, bank accounts, or make purchases online (particularly when they are traveling and have no alternative) without the fear of login information being accessed by a third party. Fortunately, I rarely encounter VPN-blocking at coffee shops. This one hasn’t yet been a biggie for me or my circumstances, but I can see how it can be a game changer for others in many areas of the world where access to independent news and information is controlled to any extent. I suspect this one hasn’t changed my life [yet]. But depending on where you travel or move to, it could very well change yours! Using a VPN can provide another level of protection to your online life by hiding your IP address (or assigning you a different IP address). In the U.S., IP anonymity is generally not critical in the course of every day, legit online activities. In certain parts of the world, however, the reality is much different. In these situations, a VPN can help avoid tracking and logging of your day-to-day online activity. 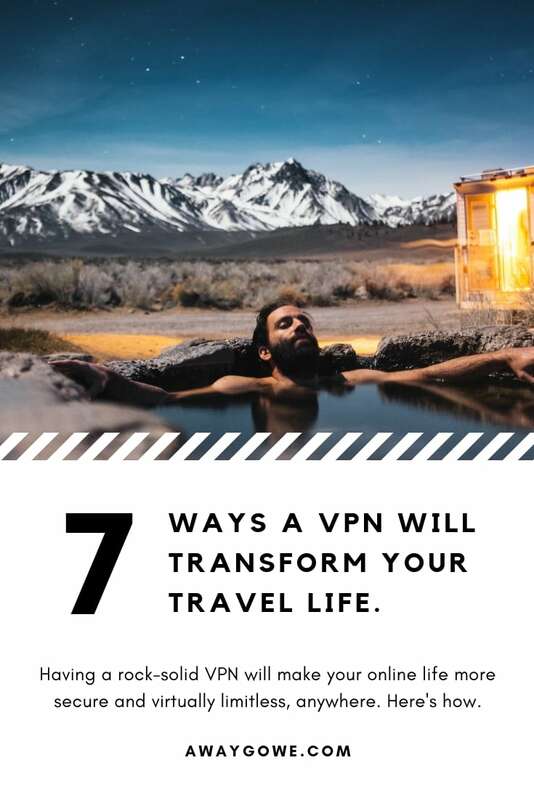 Using a VPN can be a lifesaver while traveling, giving you peace of mind and added security, while opening up doors that might previously have been locked. In most cases, the use of a VPN, itself, is legal. What you choose to do with it, however, may not be legal depending on where you are. It is up to YOU to know and understand the laws of the countries you find yourself in and to make sure you are operating within the limits of local laws. Great! So, Which is the Best VPN Service for International Travelers & Expats? Honestly, that will depend on a number of factors specific to you. What I can tell you with authority is what is currently working quite well for me and my circumstances here in Laos, and everywhere else I’ve traveled in the past year. I’ve tried a number of free services in the past, and none can compete with the VPN I’m currently using, which is PureVPN. I believe they’ve got a few different levels of pricing and services, but I’m just on the basic plan and it’s more than adequate for my needs—which don’t generally include things like online gaming, file sharing, watching Netflix, etc., but rather everything I’ve talked about here, which should give you a sense of my level of use. I haven’t encountered any noticeable issues with connecting to the service from Laos or elsewhere in the region. If I do experience issues, it’s nearly always with the internet service and/or connection and not the VPN. PureVPN also allows you to use it on up to five devices (i.e. multi-logins) across your friends and family, which means multiple people can share one account. And currently it looks like they still have the same 15-day refund that they had when I signed up. I’ve also heard really good things about NordVPN from friends and colleagues, and their online reviews are about as good as they get. I haven’t tried them myself, but looks like they are certainly worth checking out as well. Do you use a VPN for travel? Which VPN is your favorite for travel? Cover photo by Robson Hatsukami Morgan on Unsplash.